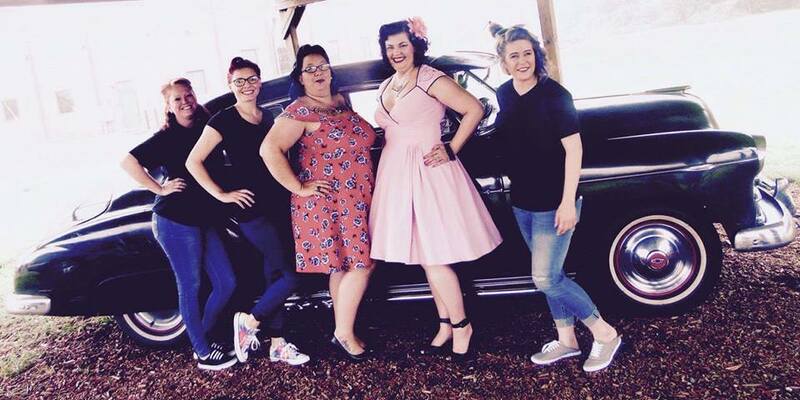 Me, Violet, and the Bombshell Crew! I've been sitting on a super awesome news for almost a whole month - I'm going to burst! I have been chosen to be the face of a new business! Bombshell Beauty and Ink is a retro hair salon and tattoo shop located in Elkhart, Indiana. I'll be at the grand opening, as Miss Bombshell, on July 30th from 3pm to 10pm. Be sure to stop by and see me! My outfit for this shoot was pretty simple - my favorite pink pug dress. Sadly, I can't remember the name of the style though it's slightly similar to the Heidi at least in the cut. The neckline is different and I have lovely embroidered swans on my shoulders. My accessories were simple black wooden bracelets from the $1 store at the mall, Cadillac necklace by Retro-a-go-go, hair flower by Carmen, and my black TUK starlet heels - they never let me down! It all came together nicely for a lovely and easy look for an early morning photo shoot - which was a blast! The staff at Bombshell Beauty and Ink are awesome! Such a fun shoot! Grand Opening is 10am to 10pm, July 30th. See you at 3! What's your favorite go to outfit? Let me know in the comments.